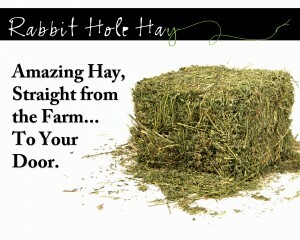 Rabbit Hole Hay is a new company that sells quality, farm fresh hay online for rabbits and other small animals. The timothy hay and alfalfa hay for sale online is packaged for freshness and delivered straight to the customer’s door. The alfalfa hay for sale and timothy hay for sale online at Rabbit Hole Hay is bought in bales from local farms in Northern California and Oregon. The hay is grown in an ideal environment which provides the perfect balance of fertile soil and cool summer temperatures. The alfalfa and timothy hay is then stored in a dry place, which helps hold in nutrients and allows the hay to last longer. The hay is then ready to be pieced, cut, weighed and shipped straight to the customer. The timothy hay and alfalfa hay for sale is available in quantities of 24 ounces, 96 ounces, 10 pounds and 15 pounds. Customers can expect an easy ordering process. Farm fresh alfalfa hay for sale and timothy hay for sale can be ordered online at http://www.rabbitholehay.com/products/. The hay is weighed for accuracy, packaged for freshness and shipped for convenience straight to the customer’s home. In addition to having alfalfa and timothy hay for sale, Rabbit Hole Hay also acts as an informational resource providing access to information on hay for rabbits, as well as rabbit care, rabbit adoption and living with a house rabbit.